I was fortunate enough to get a couple of loaner roads from Sage for my trip to Belize. It felt a little like Christmas when the package with two new Xi3’s showed up. I had a 7 wt. and a 10 wt. which armed me for everything I really needed in Belize. The 7 wt. was used most and was an especially good rod for hunting Belizean bonefish, which tend to run a bit smaller in size than Bahamian bones. 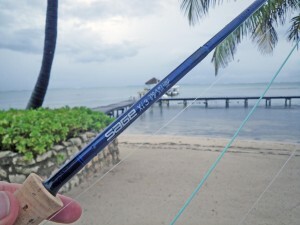 With the 7 wt., I up-lined to an 8 weight line, which cast very, very well at the short distances that you tend to be fishing when wading for bonefish. I am fast becoming a fan of up-lining when you know the distances are going to be short. These fast, modern rods have difficulty loading on shorter casts, say 40′ or under. Xi3 - a great stick. I cast the 10 for permit and for tarpon and was happy with how the Xi3 did when delivering some long casts with some bigger flies. 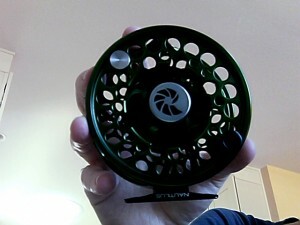 The 10 weight I actually cast with a 10 weight line (a Wonderline provided by Orvis, which did great service as well). The 10 weight didn’t feel heavy and it had plenty of power. When I hooked into that big Jack that rod bent to the cork, which was fun to watch. The Xi3 has a rather major price-tag, which is really the only drawback of the rod. You can feel the quality in the stick and I’d love to bring one out on the flats again at some point. When I finally move up to a top tier rod, the Xi3 will certainly be in the running. 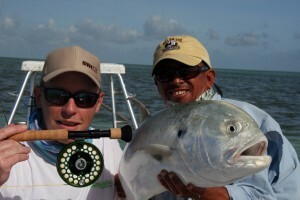 The fourth day of the trip and the third day in Belize saw us heading out with a guide for the first time. 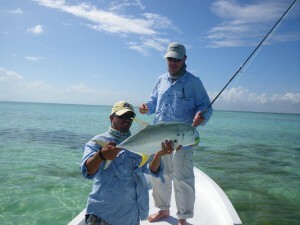 El Pescador had a stable of highly respected guides and this day we would head out with Katchu. We met him on the dock at 7 and got on the panga, heading south to head through the passage in San Padro. 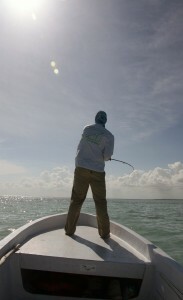 From there, we’d head north to the tarpon hunting grounds of Savannah Cay. That is what we thought was happening anyway. As we made it through the mangrove and shack lined cut to the bay side of Ambergris we surprisingly went south and in a few minutes the guide stopped the boat and, frantically, said “Where’s the permit rod? 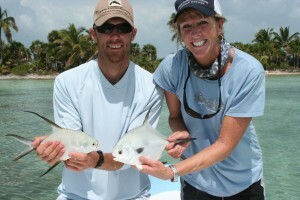 !” We weren’t rigged for permit, we thought we were headed to fish tarpon. Katchu was a big agitated, but we finally got rigged up, I was up first and I made my first cast to a school of marauding permit. They didn’t eat. We probably spent an hour chasing nervous water, but the fish were just not in range most of the time. 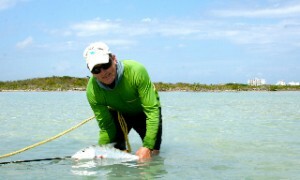 We called time on Permit and headed North for tarpon. The Savannah Cay flat is 16 miles long, all water 3-6 feet deep. The bottom is a mixture of white mud and turtle grass/aquatic plants. When we got there we saw 4 other boats. On a busy day, Katchu told us, there can be FORTY boats there. I really can’t imagine that place with 40 boats… it wouldn’t be good/fun I have a feeling. We had cloud cover when we got there, but the skies to the west were mostly clear. It was going to be a good weather day. I was up on the bow first and I surprise myself by spotting the first two tarpon. They were a bit too close to the boat. Casts were made. Fish were not eating. Katchu spotted nervous water heading toward the boat. A school of tarpon was headed for us. I made the cast. I stripped. The fish ate. I set the hook hard. I raised the rod to clear the line. Ummm… turns out you don’t clear the line like you are fishing bonefish. The fly popped out. I was 0/1 and had botched the job on my first tarpon. Shane was up next and the first fish to the boat would be coming soon. It wasn’t a tarpon, however. Nervous water, moving fast, relieved a school of jacks. Shane cast in the middle of the school and all hell broke loose. As he stripped his fly fast one fish left the school to chase the fly. Water was sheeting it over it’s head as it chased down that fly. It ate and it started its run. A Jack is a bull dog. It doesn’t jump, it doesn’t head shake. It just picks a direction and goes there. A few minutes later and Shane landed a Jack that ran about 15 pounds or so. I was up. 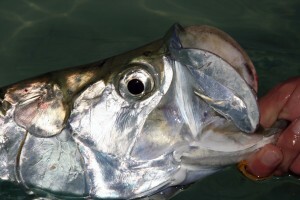 Tarpon fishing is long stretches of inactivity, punctuated by frantic moments. I stood there for a while, maybe an hour, without a fish to cast to. Then… nervous water, a school of tarpon coming towards us. I made the cast, but my strip was too fast and the fish turned away. Shane was up again. Soon, we saw a single tarpon. Shane made the cast and even I saw the fish turn, see the fly and just go up to it and open its massive mouth and eat the fly. Shane did everything right and after a few good jumps the fish was in. I was back on deck. 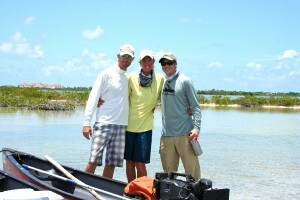 We went to the north side of Savannah Cay, but the wind had churned up the water and it was too hard to see the fish. We moved back to where we had started. Most of the other boats had left at this point and there was just one other boat, also from El Pescador, left on the 16 mile long flat. As I was on the deck, Katchu again spotted nervous water. 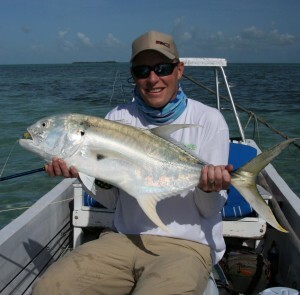 We weren’t sure if they were jacks or tarpon, but I was going to cast at them regardless. “As long as you can, get as much line as you can out and cast as far as you can!” Katchu barked. I stripped line of and started pounding false casts out to get all that line out. Just as I was about to lay down the cast I saw the fish. They were Jacks and they weren’t 80 feet away, they were 20 feet away. I tried to drop the cast short and it all didn’t go well. I had way too much slack out and couldn’t get tight to the fly. The fish moved on. There were some tense words between Shane and Katchu about the difference between “As much line as you can” and 20 feet. I think Katchu even said at one point “I can’t believe you fucked up that cast.” Katchu just wanted it all to happend and he wanted it so bad that if you screw something up, he’s prone to tell you about it. While we were still having our conversations about exactly how it all went wrong the school of jacks reappeared. I made the cast and the school went insane. The school of fish balled up in a feeding frenzy. I couldn’t see into the school, as the chaos had churned up the bottom. I just kept stripping, felt weight and set the hook. The jack just took off. I stood up there on the deck watching the line just rip out. The run lasted maybe 60 solid seconds, taking about 200 yards of line out. If ever there was a workout for a reel, this has to be it. The Nautilus NV 10-11 did the job very, very well. The Sage Xi3 10 weight we bent at the cork on this fish. Jacks are just amazingly strong and more fun than is reasonable. And it is off to the races. The Jack probably went 25 pounds, making it my largest fish ever. There were no more tarpon. There were no more jacks. We were done for the day. Even though I didn’t get a tarpon, it still felt like a good day. He had lots of fish to cast to. I had hooked my first tarpon. I had caught my largest fish ever. It had been fun. I had learned a lot. The next day was going to be about production on our last full day in Belize. The whole blogging thing is interesting, for sure. 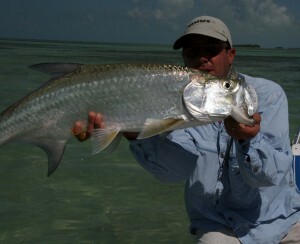 I don’t have ads and don’t cash a Bonefish on the Brain paycheck. This started as a hobby and largely remains that (just one I am kind of ridiculously dedicated to). 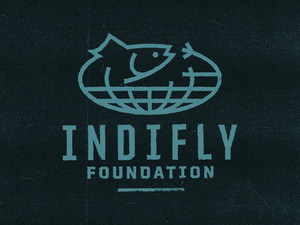 However, the distance the blog has come in the last year is pretty obvious to me when I think about all the folks who have helped put some shape to this upcoming trip to Belize. 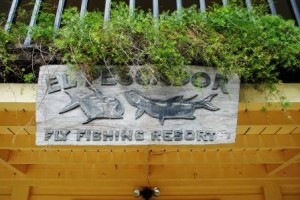 Thanks to El Pescador for hosting me for this trip. We are still paying for guides and I’m still paying for a couple of flights, but the lodging… that was huge. 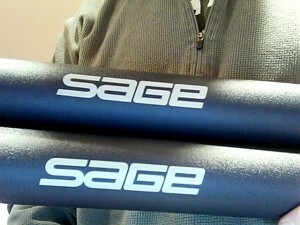 Thanks to Sage for the loaner Xi3 Seven and Ten weights. Good sticks for Belize, me thinks. Lori-Ann’s go to is the 7 wt. Xi3, so I’ll be in good company. Thanks to Orvis for the loaner 8 wt. Helios and the line for the 10 weight. 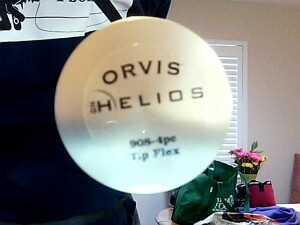 Steve offered and I couldn’t turn down a chance to see exactly how good these new Orvis rods are. Thanks to Nautilus for the loaner NV Ten-Eleven. This is actually something anyone can do… you can test drive a Nautilus, just check out the website. Mr. and Mrs. Tarpon... I'm ready to see you now. 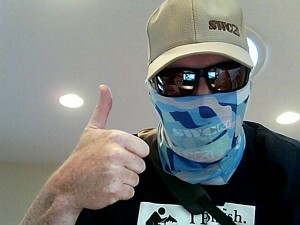 Thanks to Skinny Water Culture for two replacement sun masks (I somehow lost three in the last 6 months), a microfiber shirt and a new hat. Skin cancer is bad... SWC is good. 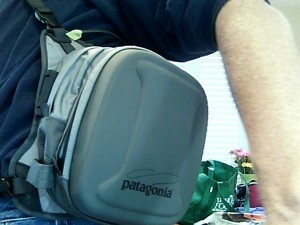 Thanks to Patagonia for a sling pack for alllllll those flies I’ll be sporting, plus a sun mask and hat. Thanks to Off the Hook Fly Shop, where I bought most of the materials used in the flies I’ll be throwing. That’s a lot of help… and if you look at my FFSI, you’ll see that I think the help you get has a lot to do with reducing suckiness… so, I have that going for me. 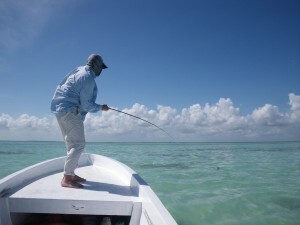 As someone recently wrote to me, “This is the most exciting bonefishing trip I’m not going on.” I hope to have some good stories to share and hope to be posting from Belize and El Pescador, assuming I have the strength left after milking each day for every ounce of fishing possible.